* Our sophisticated Bridal or Bridesmaid Neck Set has a bold 12mm soft cream pearl with a glistening 10mm Cubic Zirconia on a 15"-18" adjustable chain. * The 3/4" h earrings have 10mm pearls & 8mm CZ's. * Get the look of real diamonds & pearls at a great price! 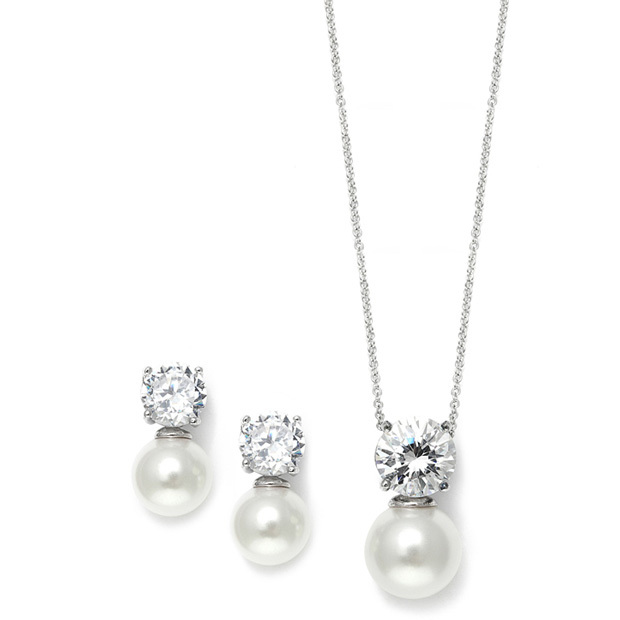 * Mariell's sophisticated wholesale Bridal or Bridesmaid Necklace & Earrings Set features a bold pearl solitaire coupled with a glistening Cubic Zirconia round. * This set has the look of fine jewelry and is available for a fabulous wholesale price! * This top-selling jewelry includes a leatherette display stand for ease of sale.